I graduated from the Air Force's Undergraduate Pilot Training (UPT) program in December of 1982 at Reese Air Force Base in Lubbock, Texas. Pinning on my silver wings was one of the proudest moments of my life. My parents, siblings and grandfather all flew out for the event. At that point I already knew that my next assignment was going to be a KC-135 tanker based in Okinawa, Japan. 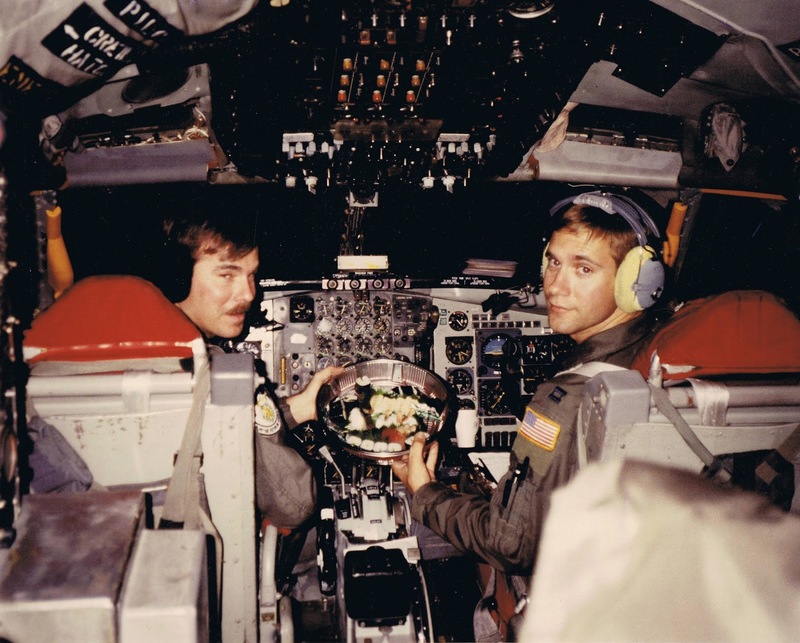 Getting assigned to the KC-135 was slightly bittersweet as I, like all 22 year old aspiring military pilots, wanted to fly a fighter. Actually, not everyone wanted fighters, but at the time, such a desire seemed downright odd. Why wouldn't you? Afterburners, Ray Ban glasses, girls, G-suits, Corvettes, girls, big watches, girls, etc. Well as it turned out, in my class of thirty or so students, there were only five fighter assignments available. And while I was good and had never "hooked" or failed a ride, I wasn't in the top five so my destiny was to fly a "heavy". Armed with the knowledge that flying a heavy lay in my future, I decided to at least have an adventure at whatever base I was to be assigned and checked the box marked "overseas volunteer" on my dream sheet. A dream sheet was the form where you'd list your preferences for aircraft and base. Normally I suppose the drones moling about at the personnel assignment command would get a good chuckle out of those dream sheets as they were tossed into the trash and your all expense paid trip to Minot, North Dakota was arranged. The assignment gods, however, took pity on me and I got my posting to Okinawa, a smallish island in the Ryukyu chain about 1300 miles south of Tokyo. There was once a battle there you may have heard about. My next stop was Castle AFB, in Merced, California where I would spend three months checking out on the KC-135 as a new copilot. This was followed by a week or so in Spokane for survival and resistance training before catching the Flying Tiger 747 "Freedom Bird" from Oakland to Okinawa. To give you an idea of how puny the engines were, the CFM-56 engines fitted on a 737 today produce about 34,000 lbs of thrust while the tanker's original P&W J-57s produced a mere 12,000 lbs. Due to it's underpowered nature, the aircraft gathered unflattering monikers such as "The Silver Sow" or "The Steam Jet". My personal favorite was "Strato-Bladder" for the bladder type fuel cells in the body tanks. As I flew the airplane in the early 80s, it had undergone a number of technology updates to its original systems but many vestiges of older technology were still on board. We still had a navigator assigned to the crew, but she had at her disposal an inertial navigation system, or INS which made her job more or less obsolete. Airliners were crossing oceans then with similar systems which had their accuracy measured in yards while GPS was still on the design table. There were so many red warnings on the engine failure pages that I think most of us flying the beast were convinced that an engine failure was pretty much game over. Thankfully I never got the opportunity to test out that proposition. Once you got the airplane away from the ground and up to altitude, it really flew quite nicely. The autopilot was primitive and rudimentary by today's standards but it did its job well enough. We'd use standard airways navigation when in range of land or the navigator would feed us headings to fly when out over the water. The actual aerial refueling process could get quite busy. Getting two airplanes together could be a challenge, especially in the weather. F-15s were easy as they had such a good radar that they always found us (and we had the gas). F-4s were hopeless, and Marine F-4s were a disaster. My job as copilot was to talk to air traffic control while operating the pumps to offload fuel to the receiver aircraft. I was also in charge of keeping our own weight and balance within limits by moving fuel around with pumps and valves. Refueling large aircraft such as the C-5 took special care. That aircraft had such a large bow wave that it would actually push the tail of the tanker around. On occasion, the forces might be too much for the autopilot which might click off without warning. One of us always had to be ready to grab the controls in that event. Sushi for the inflight meal? Once we got back from a refueling mission, we might spend some time in the pattern or there might be times when we just launched a sortie with the express purpose of only flying practice approaches. There was a simulator on Okinawa but it was a sad affair with no motion or visuals and wasn't suited for actual flight training as are modern sims. The tanker behaved reasonably well in the pattern when the weather was not very gusty. In gusty conditions, however, she became quite a handful. The reason for this is the aircraft had some very rudimentary flight controls. If you've ever wondered why fighters have a "stick", and large aircraft have a "yoke" or two handled control wheel, it's because two hands were needed to control large airplanes. Nearly all modern large airplanes are now equipped with hydraulic flight controls. That means hydraulically powered actuators move the flight controls which control the airplane in flight. Think of the power steering on your car. 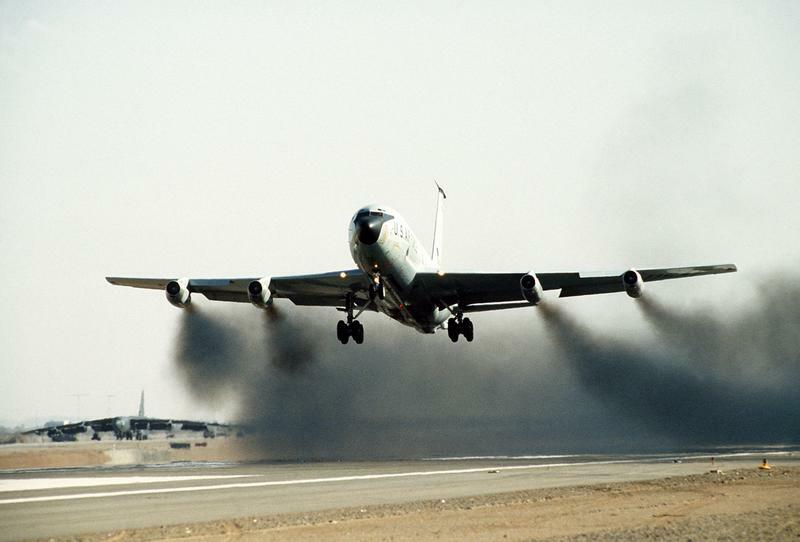 The KC-135, however, had only cable and pulley flight controls. Moving the control wheel physically pulled cables running directly to the wings. This made the controls less effective and at times sluggish, especially in gusty conditions. We joked that it was a true "fly by wire" flight control system. One of our pilots had a bad experience with this facet of the airplane. I just remember being out windsurfing that day in some truly righteous surf and north winds. Unfortunately, one of our pilots did not negotiate the crosswind landing and allowed her upwind wing to rise causing the downwind engine to strike the runway and catch fire. They landed safely, but I don't think she flew again, at least on Okinawa. 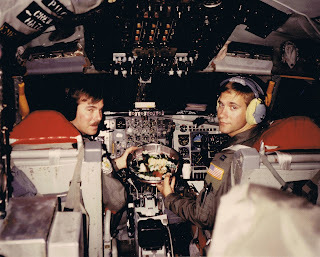 As I look back on my time flying the KC-135, I don't think I appreciated what a piece of history it represented in its technology as part of the vanguard of the jet age, or its role in both the cold war and Vietnam. It has been said that during the Vietnam era, a tanker "driver" could not buy a drink in the bar as appreciative fighter pilots returning on fumes from the North would want to thank them for them being there with some gas to get them home. The motto of my squadron, the 909th AREFS, was in fact "Always There". Nonetheless, being stationed overseas flying some real world contingency missions in your early 20s is an experience that I'll never forget. It was an awesome time. I'll finish this post with a bit of guitar lore as playing guitar is another hobby of mine. As the '50s were a heady time in the post war era, Boeing came to put the prefix "strato" in front of many of its airplanes as they would cruise in the stratosphere. There was the Stratoliner (model 307), the Stratobomber (B-47), and the Stratotanker. In 1954, a guitar builder named Leo Fender introduced a revolutionary new guitar featuring many new design elements. Having already produced guitars named the Broadcaster and the Telecaster, Fender added the strato prefix to his creation and the Stratocaster, one of the most iconic guitars ever built, went on to make rock and roll history. Very interesting. Probably maintained your flight record as I ran the flight records shop at Kaden on my second tour.